The Montreal Canadiens made masterful moves to ensure their No. 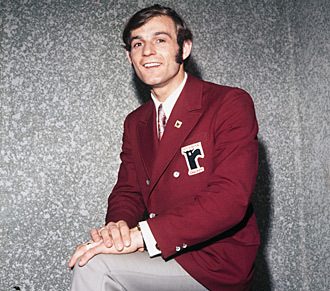 1 NHL draft pick in 1971 would be teen phenom Guy Lafleur: an SI Vault feature. As the 2015 NHL Draft and the arrival of two potentially generational players, Connor McDavid and Jack Eichel, loom, SI.com looks back at other notable teen phenoms with a series of features from the SI Vault. The fifth part of our series is this story, which originally appeared in the March 1, 1971 issue of Sports Illustrated. Links to the first four—Sidney Crosby, Eric Lindros, Mario Lemieux and Wayne Gretzky—are below. Subscribe to SI magazine here. Special Championship Offer: Get a Commemorative Chicago Blackhawks Book and Framed Cover. For years, while they finished first, all that the Montreal Canadiens watched was the top of the NHL standings. But this season the Canadiens are skating along in third place with no hope of catching the Boston Bruins, and their eyes are directed down—way down. The goal in Montreal is this: to make sure the California Golden Seals finish last. To that end—and to that end alone—the Canadiens traded Ralph Backstrom to Los Angeles a few weeks ago, when the Kings began a dangerous slide toward the cellar. For that reason and no other the Canadiens gave center Gordon Labossiere to the Minnesota North Stars when the fading Stars were desperate for goals. The very next time the North Stars met the Seals they beat them 7–1, and three of the seven were scored by Labossiere. Smart trade, noted all of Montreal. There are those in the know who say that if any team in the NHL should show signs of displacing the Seals at the bottom of the combined East-West rankings, Montreal General Manager Sammy Pollock would show up at rink-side offering a Beliveau or Cournoyer to pull them out of the slump. The reason is the latest flower of Canada’s junior hockey program, Guy Lafleur. There was a time when the two Canadian members of the NHL—Montreal and Toronto—did not have to concern themselves much over acquiring top junior hockey players; they owned them practically from birth. But new draft rules adopted some years back changed matters to give the Canadiens and the Maple Leafs only a slight preference in choosing young players, and three years ago even that advantage was taken away. Now the Canadian teams must compete in the draft on equal terms with everyone else. And everyone else has his eye on Guy Lafleur. Last season the flashing right wing of the Quebec Remparts scored 146 goals in 83 games. Already this season this 19-year-old 6-footer, who is cast in the mold of Rocket Richard, has scored more than 100 goals, and only recently he helped his team beat Rosemont by making seven goals himself and assisting on four others. It is obvious to every scout in the league that young Lafleur could play as important a part in the Canadiens’ future as his idol, Jean Beliveau, who also played in Quebec, did in their past. It is obvious, too, that the Canadiens will do everything in their power to sign him up. The first and best way to do that is to keep the California Seals in last place, for the Seals, you see, traded their first draft pick to Montreal last year. When and if the Canadiens get Guy Lafleur, sportswriters on this side of the border will surely begin calling him “another Orr.” But in French-speaking Quebec they have long been calling him something like that. “Il est en or,” the Quebecois say of Guy, meaning that he is their Golden Boy. Guy’s father rebelled at the thought of his 14-year-old son living with a strange family in Quebec City and declined the offer. But when Dumont wrote again a year later the answer was yes. For Guy Lafleur a game day in Quebec City means that he will be Exhibit A once more, and he generally arrives at the Coliseum at 3:30 for an 8:15 contest. “I like to sit in the Coliseum by myself and think about the game,” he says. “I play over in my mind what I think the game will be like, and I always see myself scoring between three and six goals.” All afternoon the phone rings in the Remparts office. Suzanne Belanger, the petite secretary, writes down names and hands them to Jean Sawyer, the publicist, who later will give them to Maurice Filion, coach of the Remparts. “Scouts,” Sawyer explains, using one of his few English words. After his “psych session,” as he calls it, Guy walks down to the Remparts’ dressing room to check his skates and his sticks. Alongside his locker stall, taped to a wall, is a large color picture of Jean Beliveau in his Canadien uniform. “That man is my hero,” Guy says. “I may never be able to play hockey like him but I’d like to be the man he is.” Guy’s fingers go down the blades of his skates. His hands are enormous. “I used to milk cows and rake hay during the summers when I was young,” he continues. “I’ve always had big hands because of that. In hockey big hands are very important.” Some of the other Remparts drop into the room, and they start to kid Lafleur about something. “Go ahead, tell him,” they say. Guy remains silent, so one of his teammates tells a story. Before one recent game Bernie Geoffrion, now a scout for the New York Rangers, brought Jeep George, another Ranger scout, into the Remparts’ dressing room to see Lafleur. Then Boom Boom talked with Claude Dolbec, the coach of the Shawinigan Bruins, Lafleur’s opposition that night. Both Geoffrion and Dolbec agreed that, among other things, Lafleur is too strong for the Junior “A”, that he should be in the NHL now. Indeed, he has scored almost twice as many goals as any other player in the league. At precisely 8:15 p.m. the Remparts skated onto the ice to a musical chorus rivaled only by the sing-along atmosphere of the St. Louis Blues’ arena. The people were standing four deep in many places, even though there were a few empty seats high in the end balconies. “They want to see Lafleur up close,” a local broadcaster explained. It was not a good game, and the crowd was silent throughout the first period. Then, in the second period Lafleur, back-checking tenaciously, stole the puck at center ice and started to skate swiftly down the right wing. The whole Coliseum was electrified. Lafleur scored another goal that night, and also got an assist. He played a very disciplined game—the type of game NHL coaches prefer—and rarely strayed away from his right wing. “Very professional,” said Geoffrion. One thing Lafleur did against Shawinigan that escaped general attention but caught the eyes of the scouts was the manner in which he handled a Shawinigan defenseman, Ghislain Boisvert, after Boisvert had illegally manhandled him near the goal. When the action turned back up ice Lafleur retaliated swiftly. Boisvert suddenly was on the ice, and the referee, who missed the incident, had to call time out while the Shawinigan trainer attended to the defenseman. 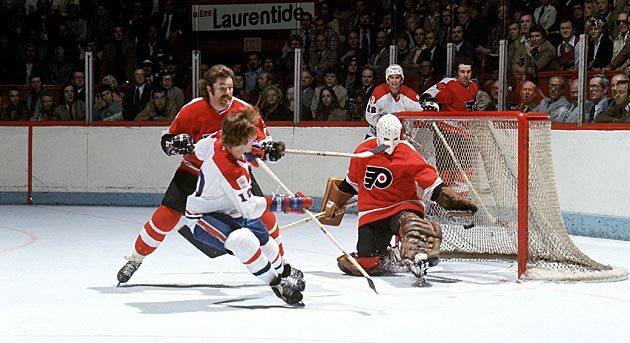 “Lafleur’s already learned some of Gordie Howe’s old tricks,” said Roland Mercier. Lafleur and the Remparts lost to Shawinigan 5–4 that night, only their third loss all year. Before their next game Lafleur and his coach flew to Montreal, where Guy received a plaque from the Club Medaille d’Or as the outstanding French-Canadian athlete of the month. Of course, someone asked him if he would like to play for the Canadiens? Guy only smiled.